Jerusalem (AFP) – Gains by President Bashar al-Assad’s forces in the Syrian civil war present advantages for Israel even though the two countries remain technically at war, Defence Minister Avigdor Lieberman said Thursday. “In Syria, as far as we are concerned, the situation is returning to the previous one before the civil war, meaning there is a clear address, there is responsibility and there is a central government,” Lieberman told journalists while visiting Israeli air defences. Before the civil war erupted in 2011, the ceasefire line between Syria and Israel was largely quiet for years. AFP/File / Youssef KARWASHAN. 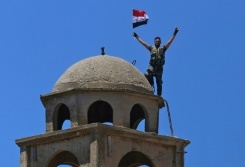 A Syrian soldier waves the national flag atop the Greek Orthodox Church of St. George in Quneitra on July 27, 2018 after rebels fled the abandoned Golan Heights town in the face of a sweeping offensive by President Bashar al-Assad’s forces. During the conflict, there has been occasional spillover fire to which Israel has responded. Assad told his troops on Wednesday they were close to victory after inflicting a succession of defeats on rebels. A series of blistering offensives backed by Moscow and Tehran has forced the rebels out of many of their strongholds, putting Assad’s government back in control of nearly two-thirds of the country. Israel has sought to avoid direct involvement in the Syrian conflict but acknowledges carrying out dozens of air strikes there to stop what it says are deliveries of advanced weaponry to its Lebanese enemy Hezbollah. “We do not interfere or intervene in Syria’s internal affairs,” Lieberman said. He named them as a strict observance of a 1974 armistice with Syria, not allowing Iran to use Syria as a front against Israel and not allowing Syria to be used as a transit point for advanced arms deliveries to Hezbollah. The two countries remain technically at war. Featured Photo: Syrian Presidency Facebook page/AFP / HO. 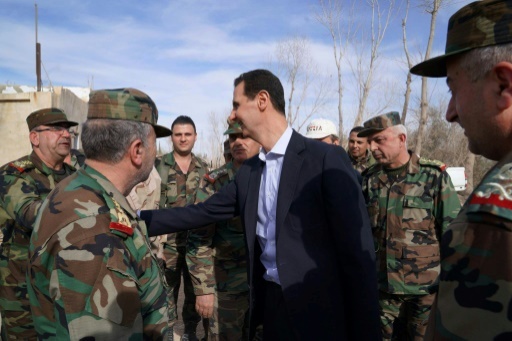 Syrian President Bashar al-Assad greets troops in the Eastern Ghouta district outside Damascus on March 18, 2018, in his first visit after its recapture from rebels in a Russian-backed offensive.